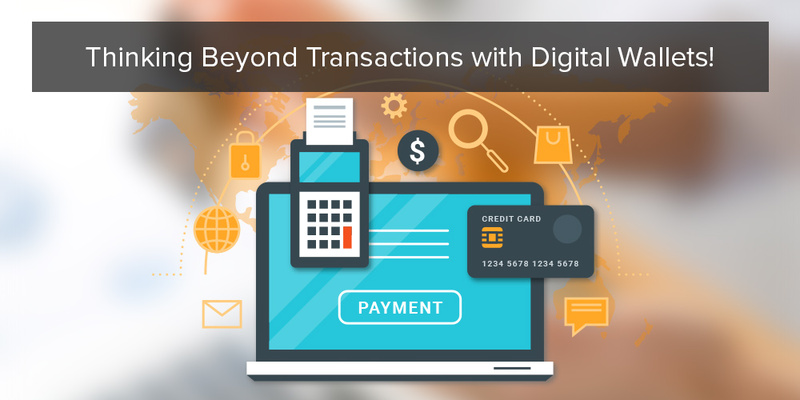 Home » mobile app » Thinking Beyond Transactions with Digital Wallets! The recent development in online shopping have changed the way companies approach towards payment modes. Online payment modes are more preferred by both vendors and customers due to seamless transaction they could perform with fool proof security. However, the users are hesitant to share their credit/debit card credentials with 3rd party websites and service provider for initiating the payment. Individuals who have been the victim of phishing attack by sharing such credentials tend to be more hesitant in sharing such details. Although, the technology has been much advanced when compared to earlier days and took the element of fear and made the process much smoother and secure. This is where a mobile wallet app comes into play. A mobile wallet app makes it easier for the customer to pay for a wide range of products, both online and offline through a smartphone. Rather than utilizing a credit/debit card or net banking, the user can make use of such money remittance app to make payment via your smartphones. It is easy, secure, and more convenient to pay. Tech giants like Google and Apple have their own payment wallet apps. Mobile wallet make use of mobile data or even NFC to initiate payments just in a tap of your fingers. The payment through these wallets are efficient, as well. As such apps are interconnected with the reward section of the service provide, they will automatically avail the best discounts for your purchase and eventually help you in save big. Since, mobile wallet apps are installed in your phones, you don’t have to worry about anything else while initiating the payments. Mobile wallets are secure and it is simple for you to track your payments. Since you don’t need to carry credit/debit cards with you, it is very simple and easy to initiate payments. MNC’s like Apple, Google, and Samsung have raided into the mobile wallet industry influencing it to grow much faster. Aside from the payment abilities, features like improving sale and customer loyalty have made money remittance app so popular and eminent in the on demand industry. In the developing countries like India have committed mobile wallet apps like Paytm, mobikwik, payumoney etc. have facilitated the payment process to be easier. Money remittance app let the users make payment without any hassles of carrying a credit/debit and entering the points of interest each time they have to pay on the web. You simply need to deliver cash in your wallet and utilize it to pay for stock that you purchase. As it is secure and makes the procedure of installment quick and helpful, it has come up as another method of installment both on the web and offline. With the accessibility of mobile wallet solutions from key ecommerce industries and new players, this industry has been on the positive side of outcomes.As per reports, it suggests that users incline toward the payments through mobile wallets while purchasing merchandise from the different ecommerce stores. When compared with the developing countries, the mobile wallet solutions has always made a buzz. By offering cash back to the customers, these mobile wallets have made a trustful place in the ecommerce industry and developing along with it. The future of mobile ecommerce looks encouraging with mobile wallets. With the integration of these wallets into the ecommerce apps, paying for anything online will be possible with just a click. Mobile/Digital wallet applications are unquestionably the future of online and offline payment. The payment is made in a simple manner and is secure because of the advanced encryption technologies. This payment method is beneficial for the customers and the vendors. With numerous large enterprise entering into mobile wallet app sector, we can anticipate that the service will turn out to be far better with time. More new technologies are likely going to strengthen the services and make it more secure and easy to understand.